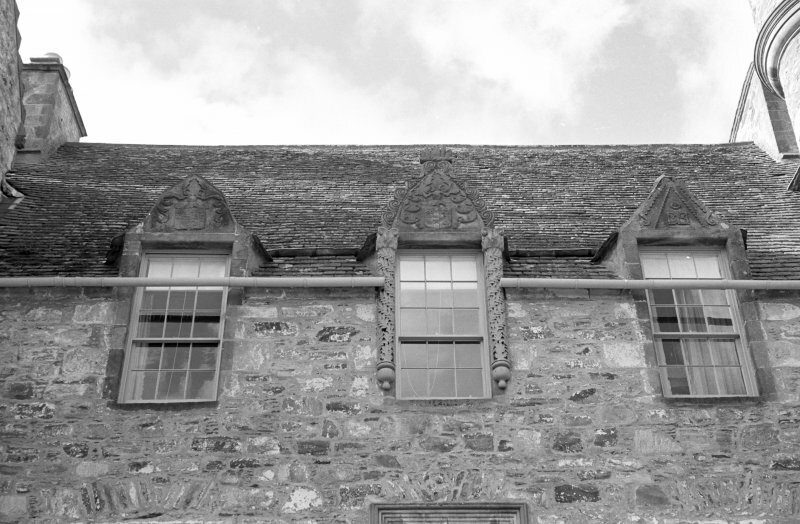 Detail of Faith and Hope windows and carved panels, N elevation of courtyard, Cullen House. 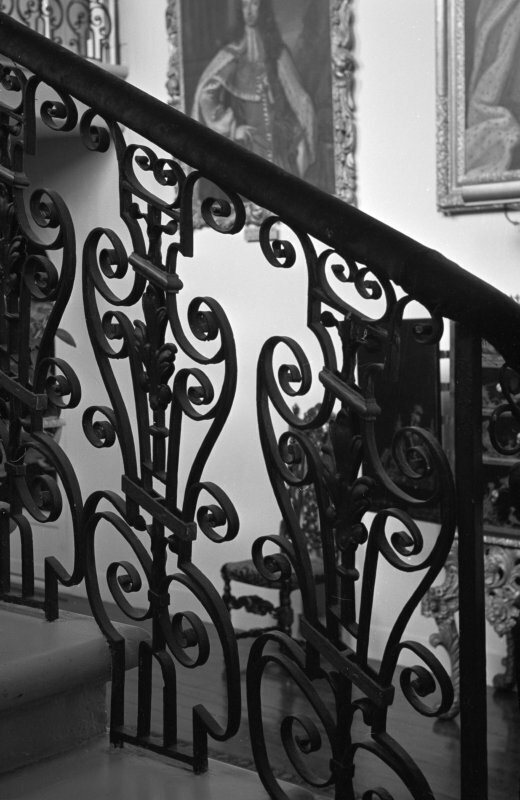 Interior view of Cullen House showing detail of main staircase balusters. 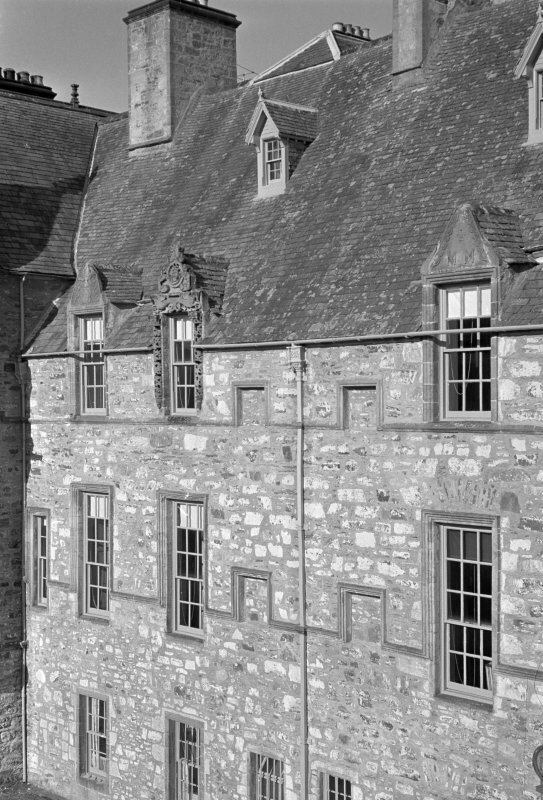 View of N elevation of courtyard, Cullen House courtyard. 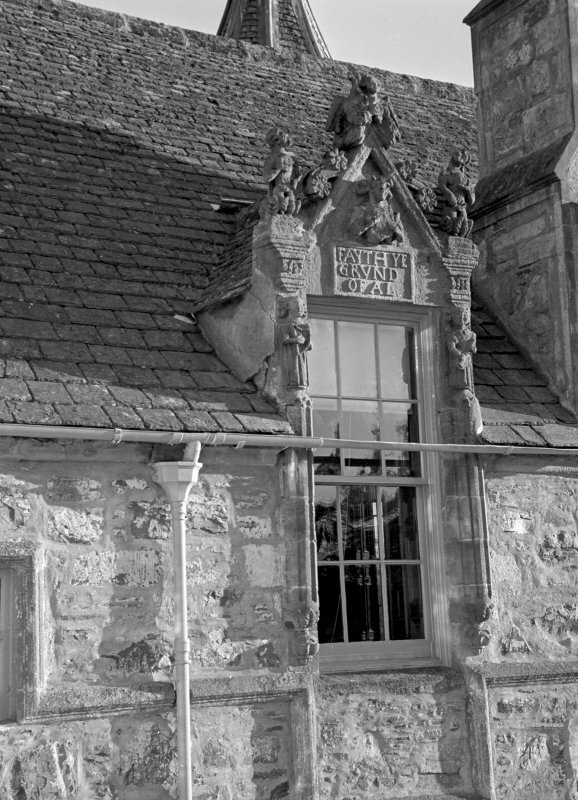 Detail of carved pediment depicting Faith, N elevation of courtyard, Cullen House. 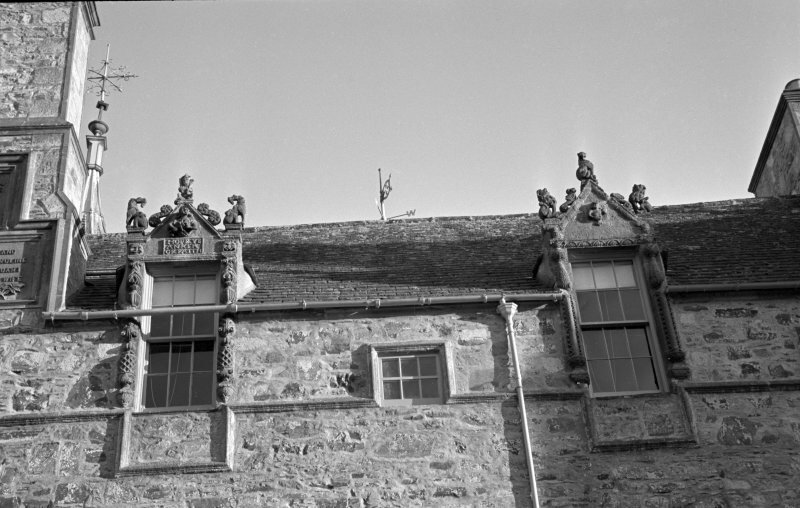 Detail of W elevation of courtyard, Cullen House showing carved pediments. 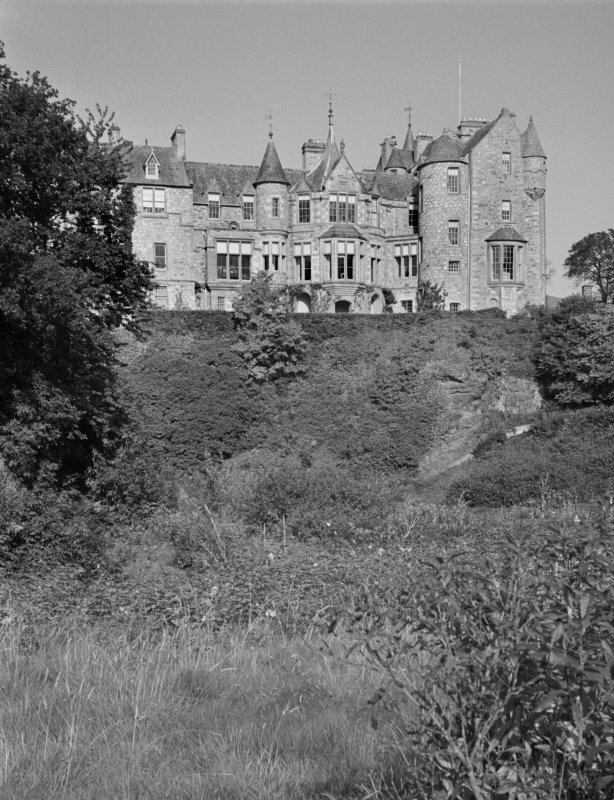 View of Cullen House from SE. 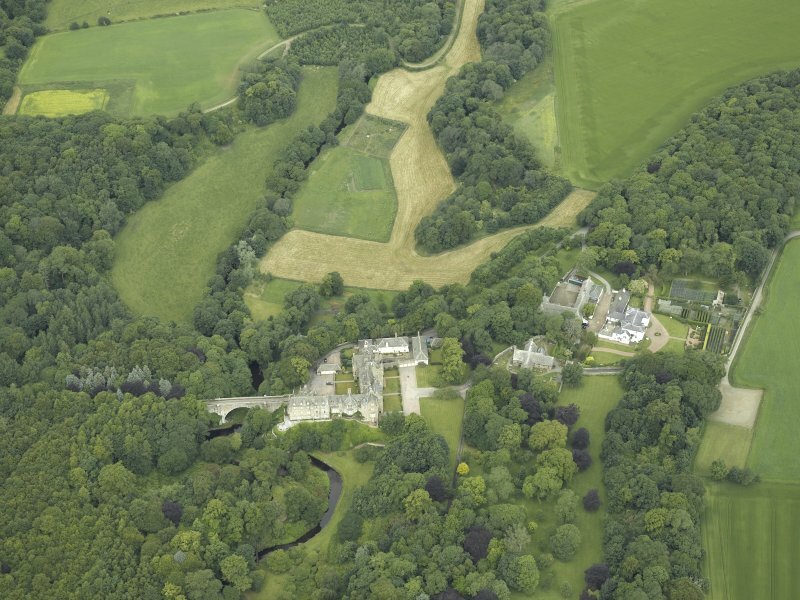 Oblique aerial view centred on the country house, stables and bridge, taken from the SSW. 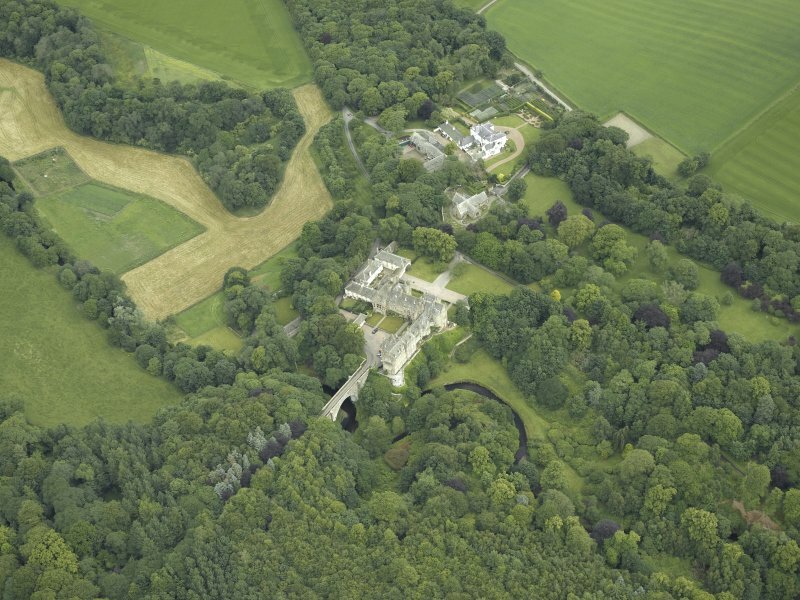 Oblique aerial view centred on the country house, stables and bridge, taken from the WSW. 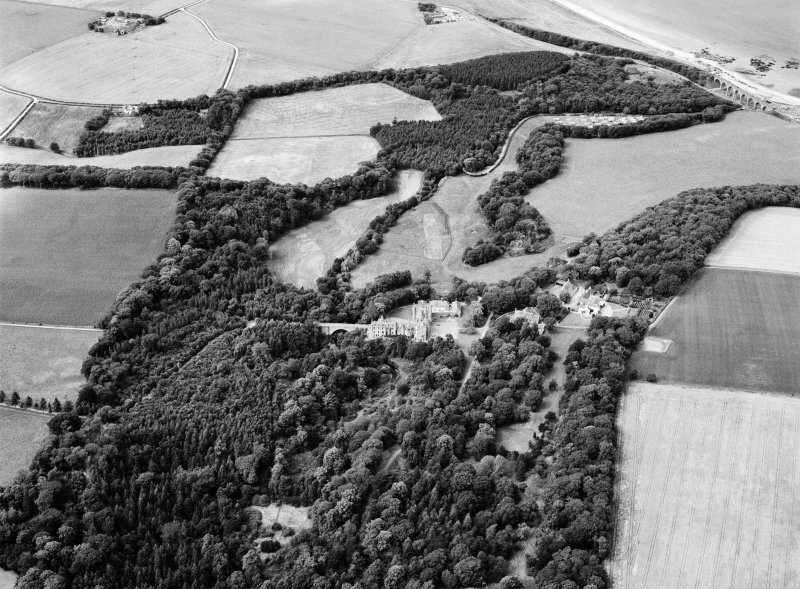 Oblique aerial view centred on Cullen House, looking to the NNW. 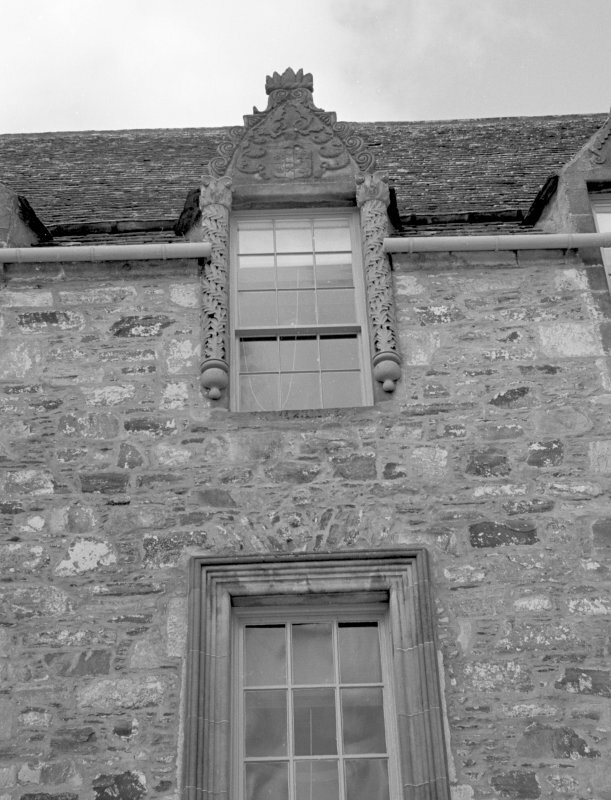 Detail of carved pediments, E front, Cullen House. Detail of carved pediment, E front, Cullen House. 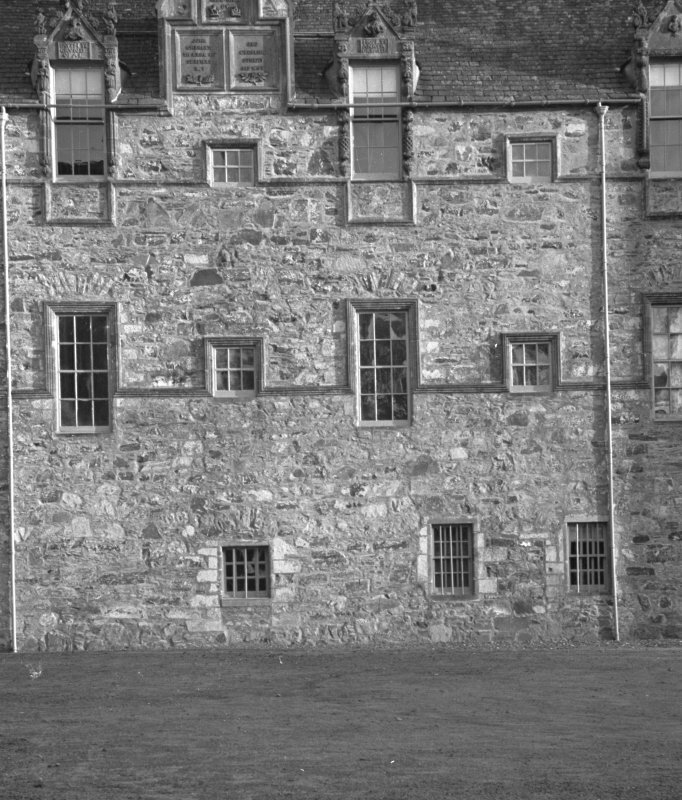 View of N elevation of courtyard, Cullen House. 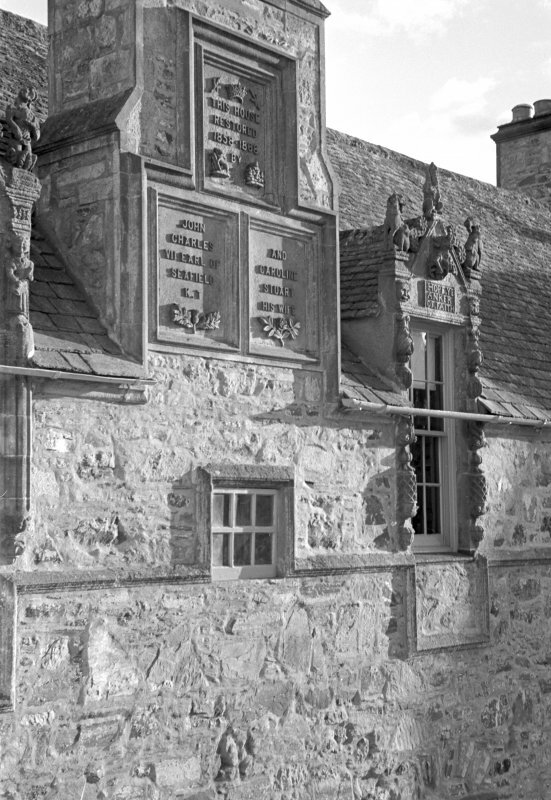 Detail of carved pediments, N elevation of courtyard, Cullen House. 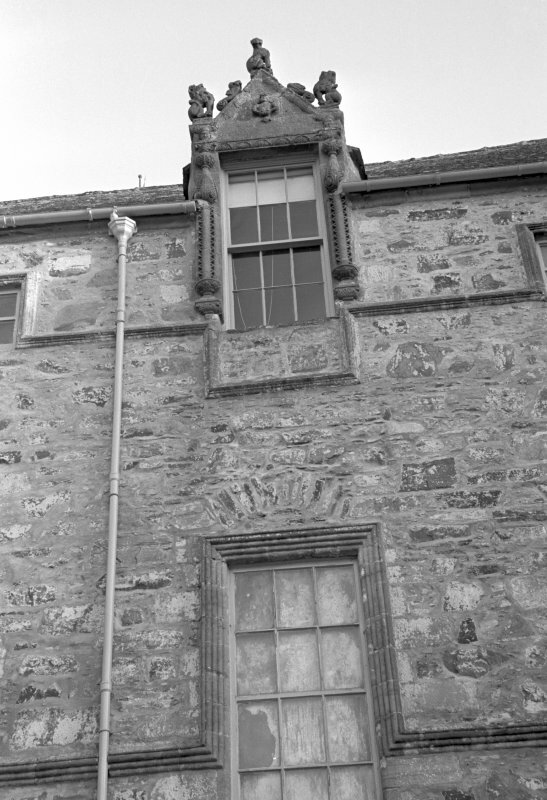 Detail of original doorway in W front of courtyard, Cullen House. 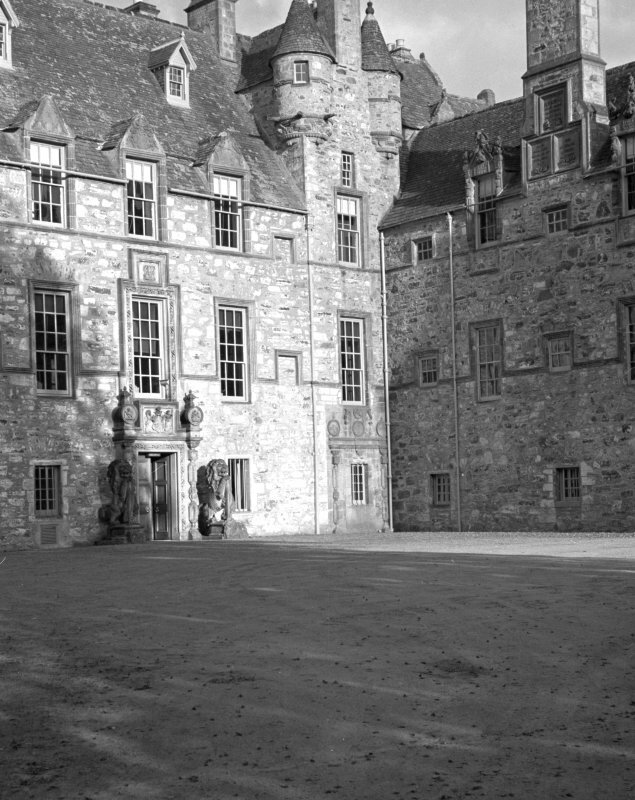 View of Cullen House courtyard from NW. 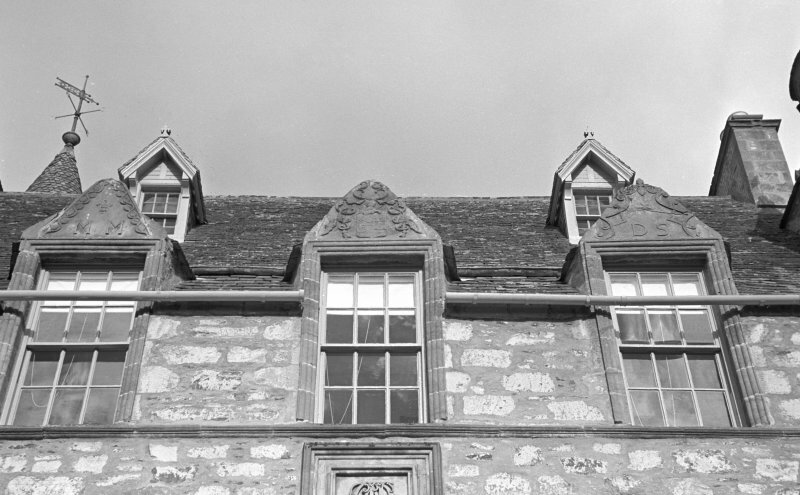 Detail of W elevation of courtyard, Cullen House. 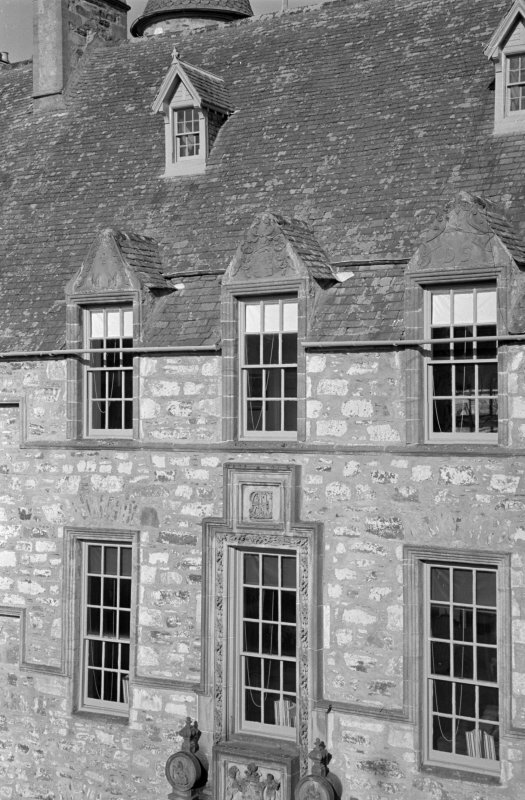 Detail of W front of courtyard, Cullen House. 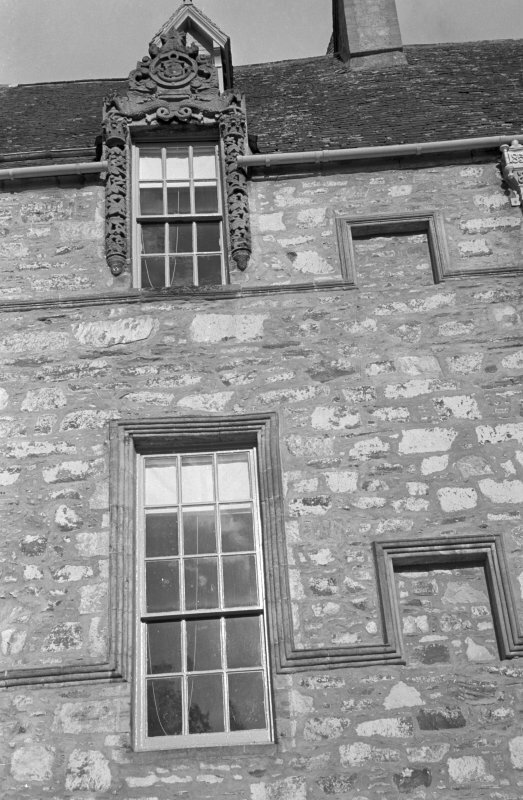 Detail of carved pediments, W elevation of courtyard, Cullen House. Perspective view of Cullen House. 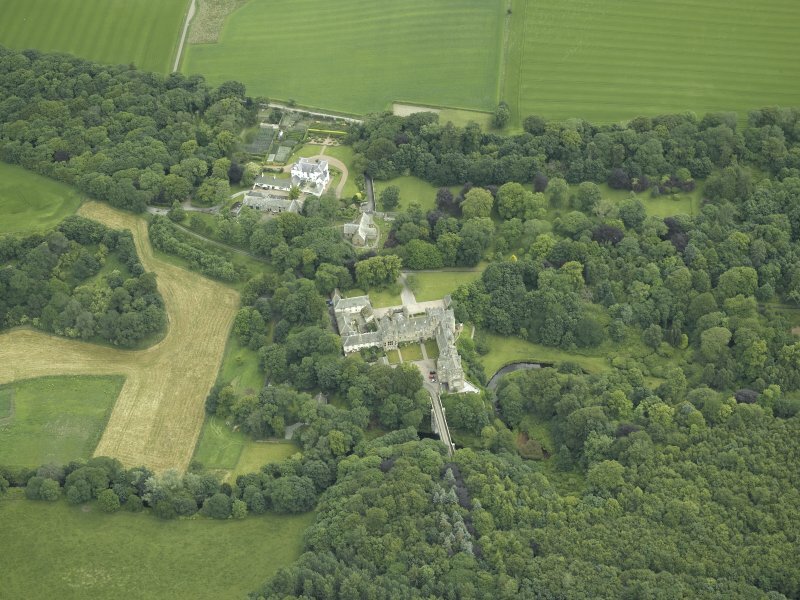 Oblique aerial view centred on the country house, stables and bridge, taken from the NW. 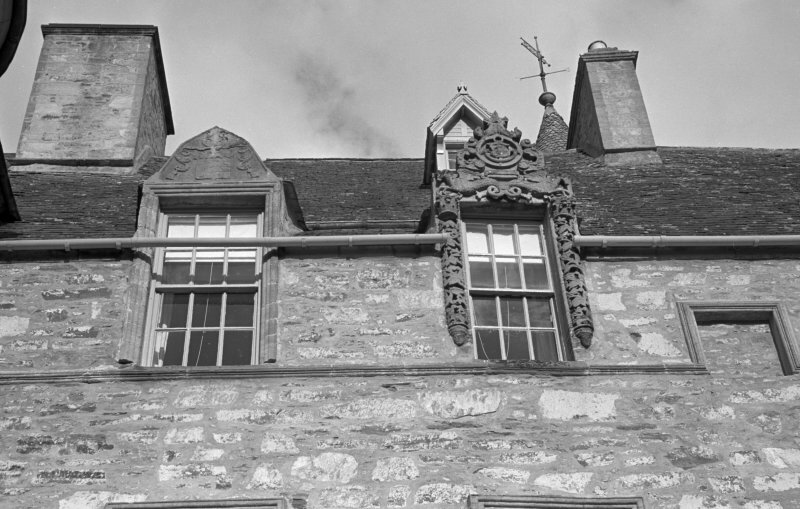 Detail of carved pediment, N elevation of courtyard, Cullen House. Detail of carved pediment, W elevation of courtyard, Cullen House. 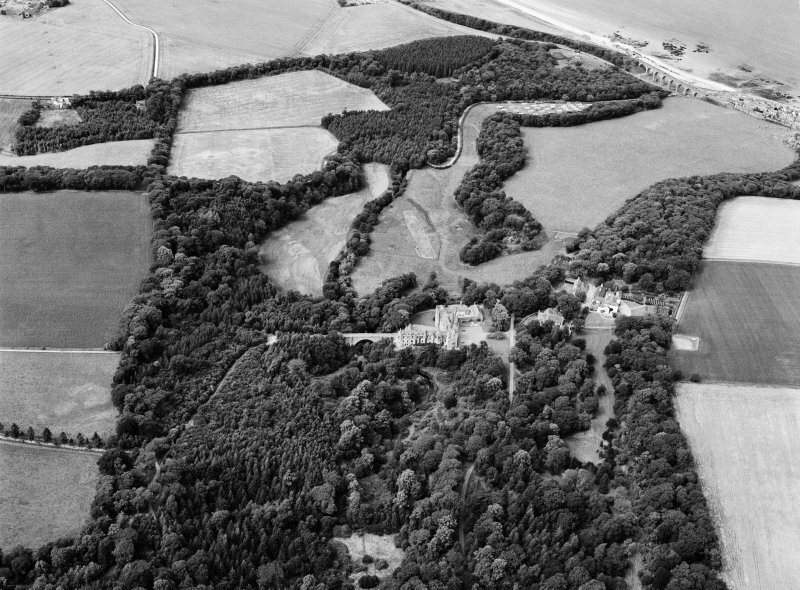 Oblique aerial view centred on the country house, stables and bridge, taken from the SW.
Digital image of a photographic copy of a perspective sketch of Cullen House. Detail of Hope window and carved panels, Cullen House. For Cullen House, Marywell Cottage (NJ 49953 66508), see NJ46NE 33. For Saint Mary's Collegiate Church (NJ 5072 6635), Cullen, Bede-House or Hospital (NJ 5086 6608), Cullen, Old Town (NJ 507 663) and the house of 'Muldavit' (NJ c. 504 662), see NJ56NW 5, NJ56NW 7, NJ56NW 8, NJ56NW 33 respectively: all these sites lie within the policies of Cullen House. The policies of Cullen House comprise parts of both Cullen and Rathven parishes. 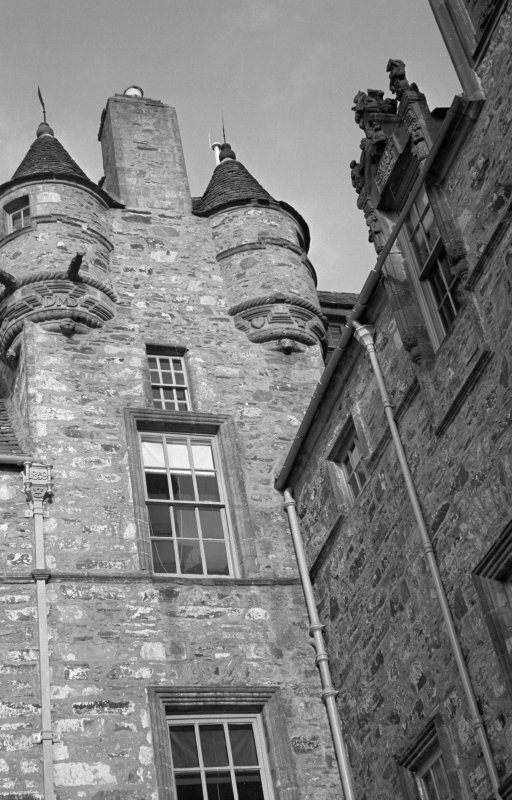 As early as 1264 mention is made of the house of 'Inverculain'. The six pebends instituted on the founding of the Collegiate Church (56NW 5) in 1543, are thought to have occupied the oldest part of the building. 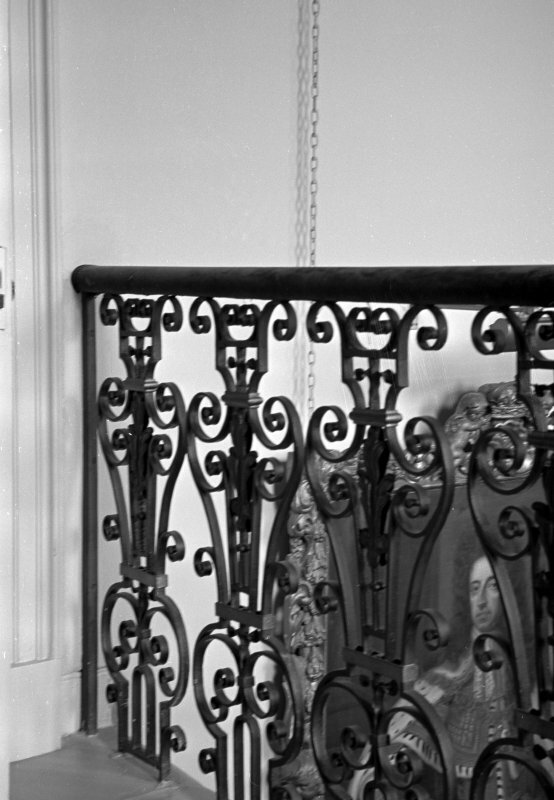 The greater part of the modern house was not erected until the beginning of the 17th century, although the E front, and the building containing the great staircase, date from a century later. The house now forms a simple 'L', more additions having been made about 1858. 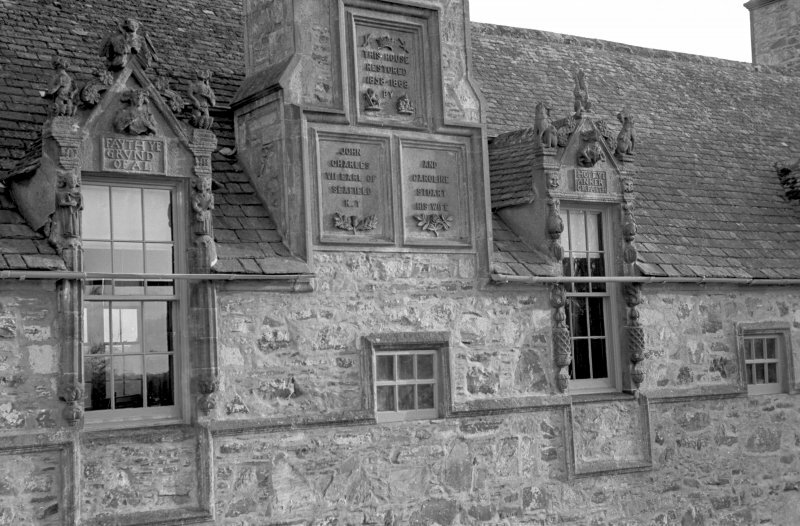 The house was plundered during the Montrose wars, and again in 1745. Country Life 1906; C A Ritchie nd. 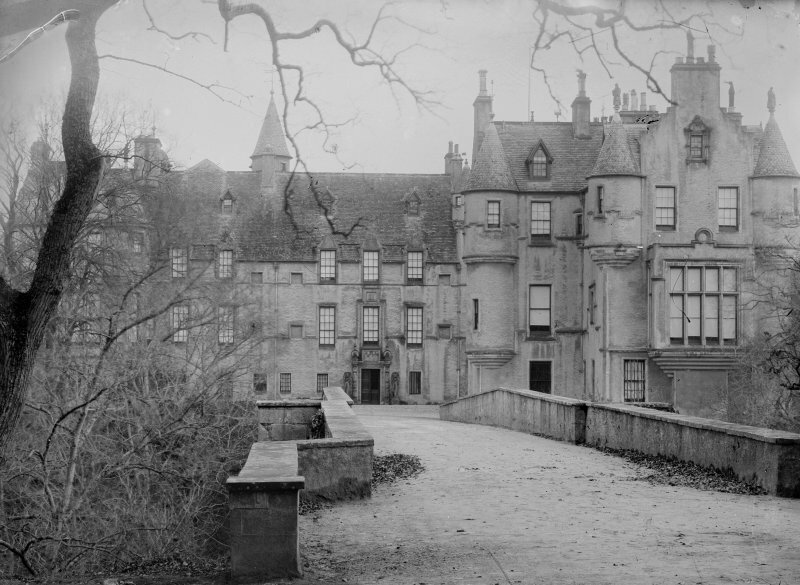 Cullen House, in good repair, the residence of the Countess of Seafield, and open to the public, is a large mansion comprising the building periods mentioned above. Visited by OS (WDJ) 15 September 1961. Visited by OS (NKB) 27 July 1967. (Classified as Site of Regional Significance). 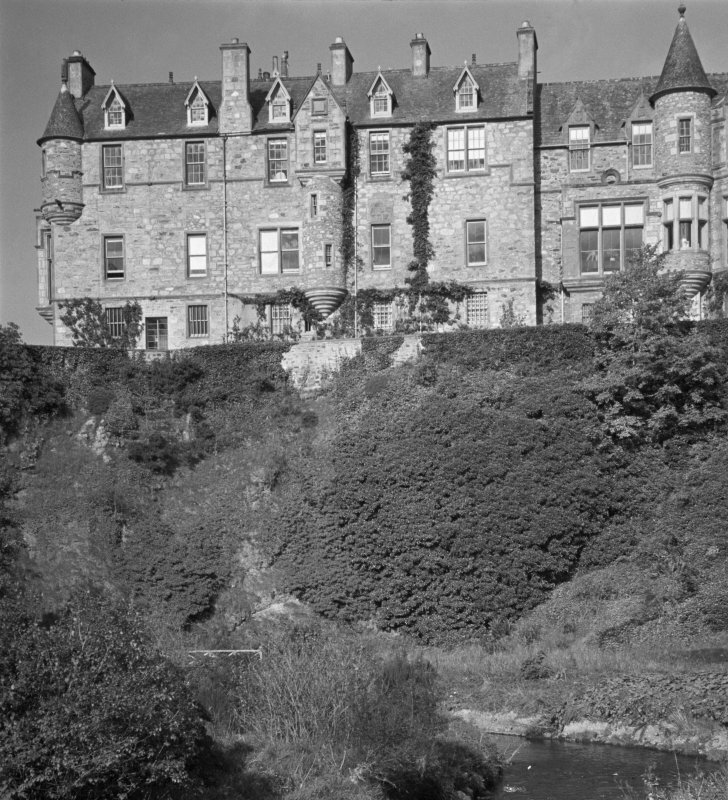 This mansion (the home of the Ogilvies, Earls of Seafield) is situated on a gentle slope at an altitude of 25m OD; it occupies a rocky bluff overlooking the Cullen Burn and succeeds an L-plan tower-house built 1600 on another site, and possibly incorporating earlier fabric. Mention is made of Inverculain as early as 1264. Tower at SE angle with long wing to W of pre-1602 origin. 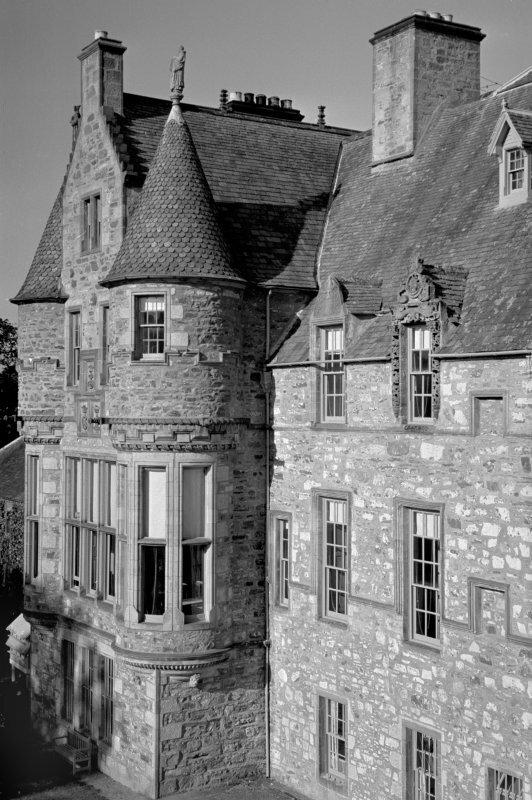 Substantial late 17th/early 18th century building, the principal surviving additions and alterations being those if 19th century date and Scottish Baronial style by David Bryce. 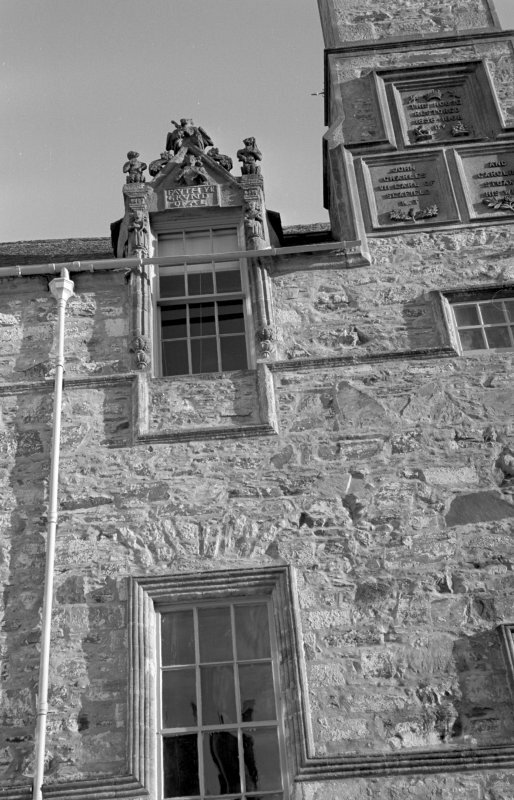 The N-facing elevation to the courtyard retains 17th details and earlier fabric. 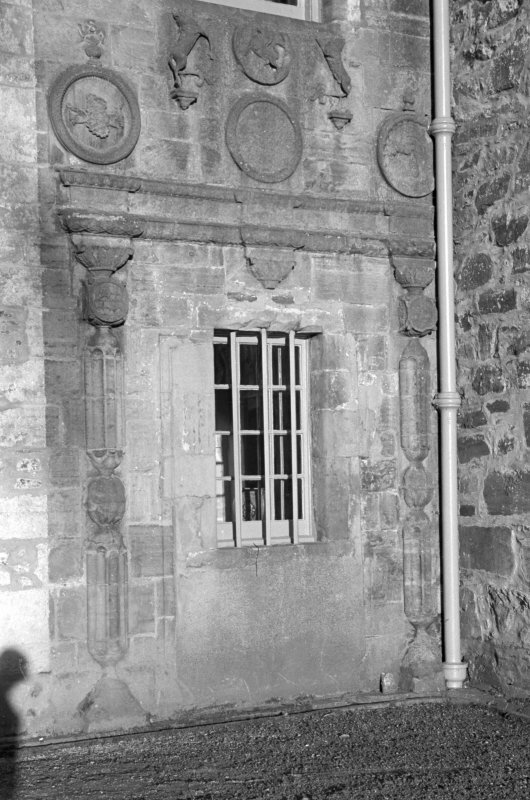 Original entrance to tower in tight angle at S of N-S range; square tower at S of 1668 with some reworking; painted ceiling of c. 1662 in former library. 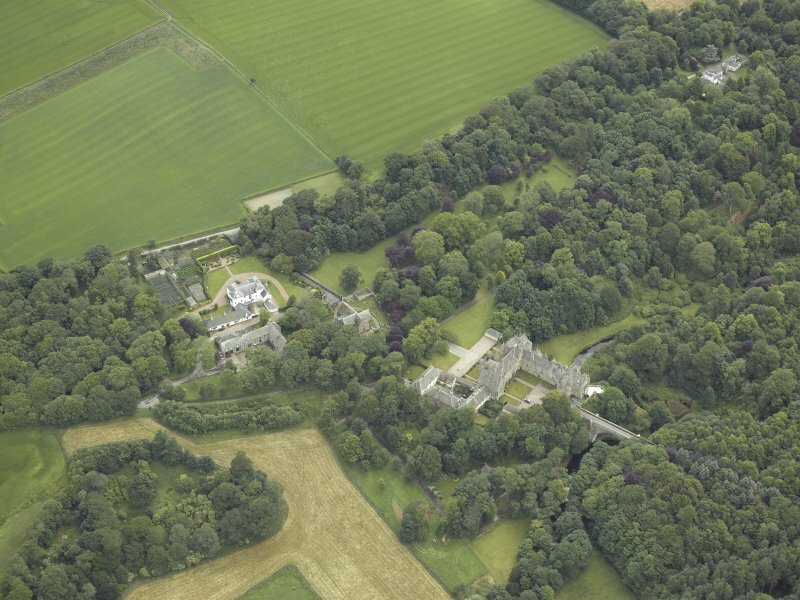 The mansion was sold by the Earl of Seafield in 1981 to Kit Martin who converted it into self-catering flats. The S and SW portion was badly damaged in 1987 by a fire which destroyed the painted ceiling. 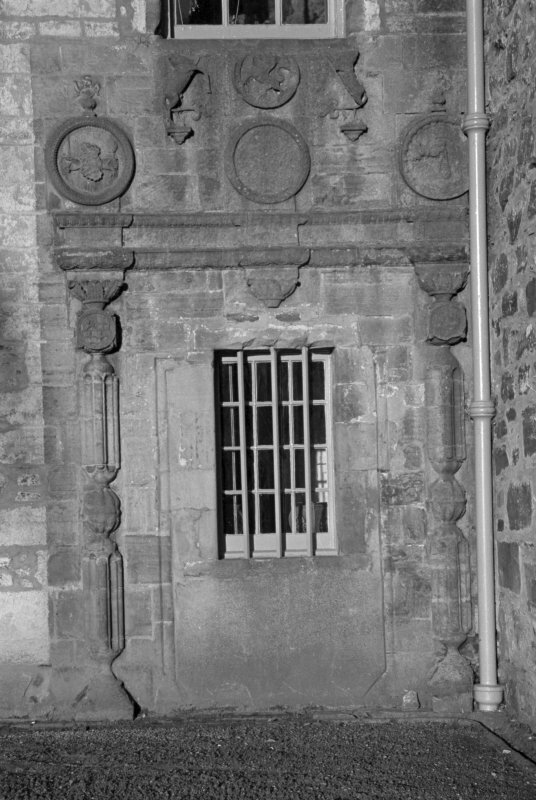 Restoration was in progress in 1988. 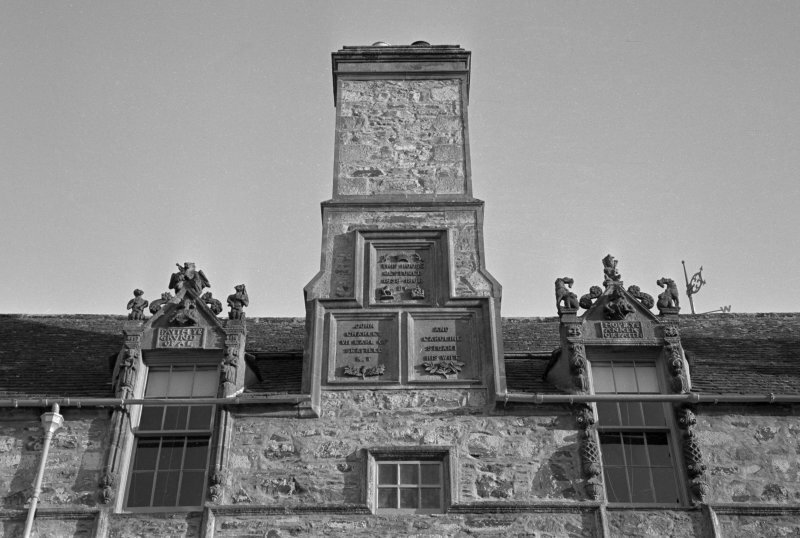 Architects: Smith and McGill 1709; John and James Adam; James Playfair; David Bryce (1858-9); Douglas Forrest (1982-4). [List of periodical and newspaper references appended]. Two portfolios are preserved in the Estate Office, one of the drawings by the Adam brothers containing plan of Gate House similiar to that erected but without pilasters, plan and elevation of staircase elevations of walls of library and drawings of ceilings of staircase, vestibule and library, all signed James Adam, Adelphi, 1767. The central ornament in the ceiling of the staircase is all that jow remains of the work shown on the drawings. 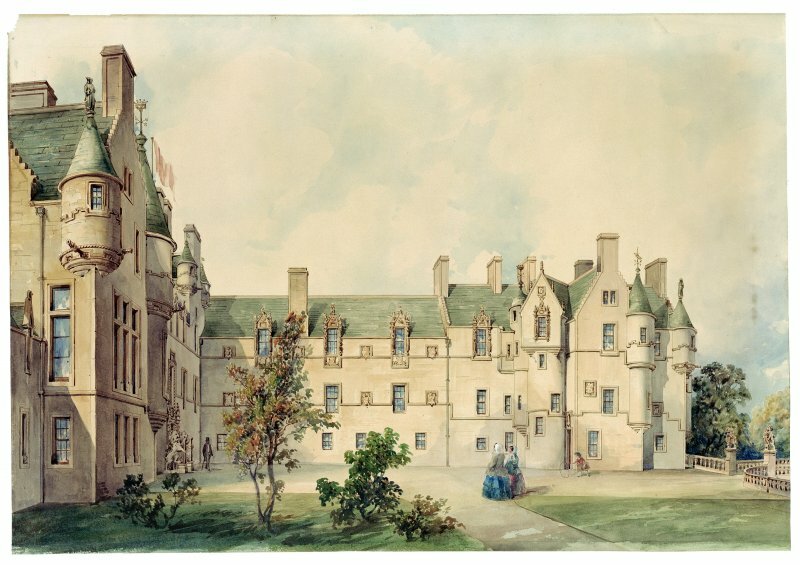 This postfolio also contains drawings by Robert Adam for a Town House and a house on Speyside. The other portfolio contains drawings signed by Playfair dated 1783 of a Temple with potico and semi-circular apse not unlike the existing one in style, also plans and elevations of a proposed house at Easter Elchies, Morayshire, and proposed elevations for the Hall in Cullen House of which there is now no sign and various schemes for altering front elevation making it 18th century Gothic. Stucco and plaster work at Cullen House. Account for #89. 8. 8. Jan 1789. Men's wages for filling ice house. Letter 1777 from brussels, E of Findlater to james Ross. Library finishing. 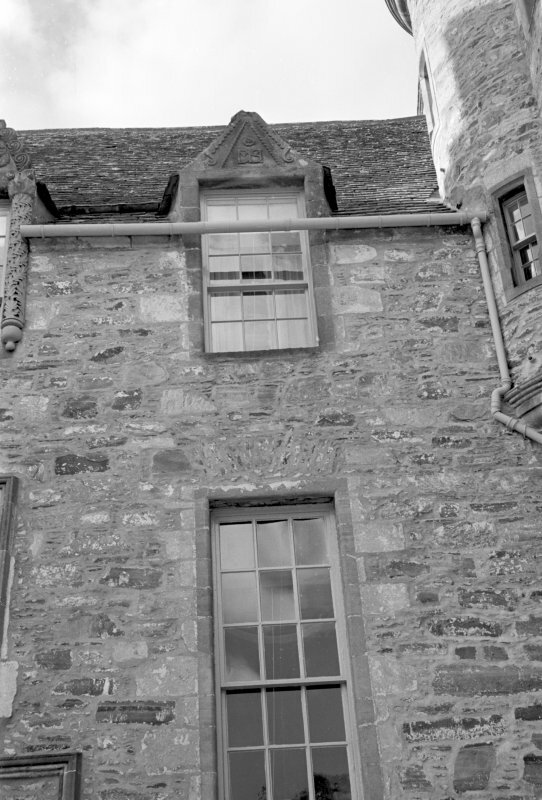 Granary at Portsoy to be built this summer. Spa. Oct. 2nd, 1777. 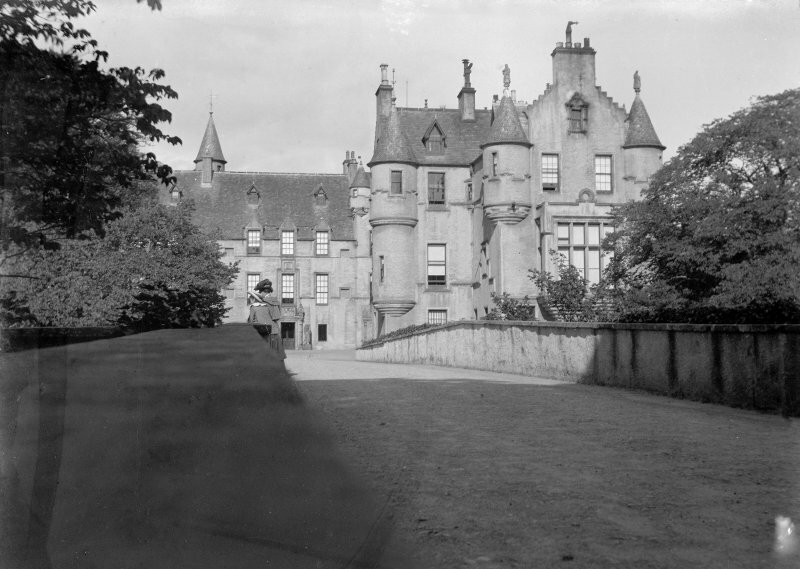 E. of Findlater to John Ross, interested to know if Mr Baxter saw house at Elchies, wiches to see his plan for the new stair and other alterations at Cullen House. E. of Findlater to John Ross wishes Baxter's opinion of another situation for a stair in case he wishes to change the present great stair and dining room, wants plan of present family apartments, wishes bow windows of a circular form. Would be glad that Mr Baxter take a look at the House of Elchies and make a plan and estimate for such alts. and adds necessary to make a commodious accomodation. John Ross to E. of Findlater. Bow window almost finished. Wishes his 'lop' would send drawings for finishing of the room. State of buildings sketch of alts. of the stair to be made by mr baxter. Brussels. French architect very good at internal distribution (planning of a house). John Ross to E. of F. Sends his lop. Mr Baxter's sketch for finishing the Bow room. John Adam to E. of F. Gate of Wilderness ordered from Carron. 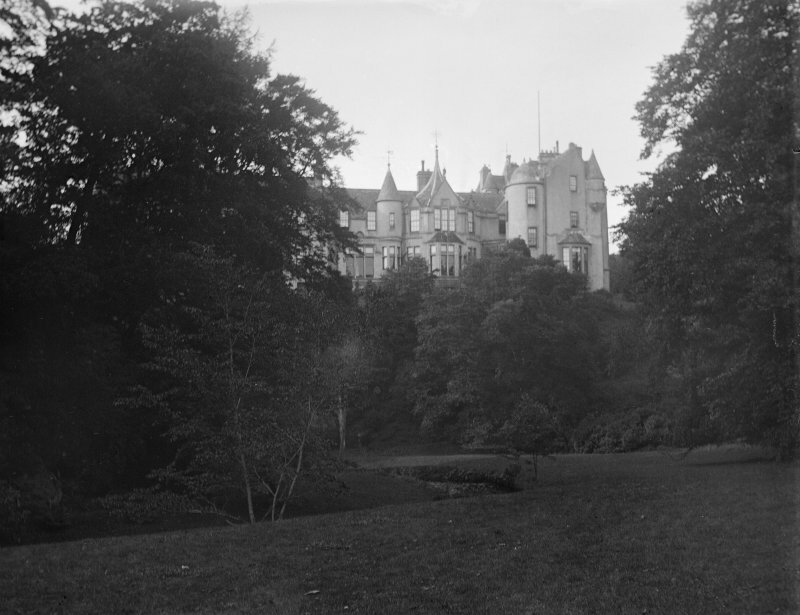 "Ld Erskine left orders with Mr Chairs Statuary at Hide Park, from whom your Statue [s] are bespock, to put them aboord of a ship for Inverness, derected for Sir Lud: and to send by the post a Bill of loading & a copy of his account, Ld Erskine gave strick charges not to exceed Your Summ...he will be anxious to know how you approve of the Statues. The Dial Plate Ld E bought from Watkins & pay'd three Guineas for it, so it should not be charged in Chair's Account..."
May 19 Masonwork of " "
Jan 5 1822 Mason Work at Temple, I Smith #41.19.3. Drawings stored in Edinburgh (see architecture catalogue Grampian - Moray - C-D) by James Munro 1930-31 - plan, elevation and details. 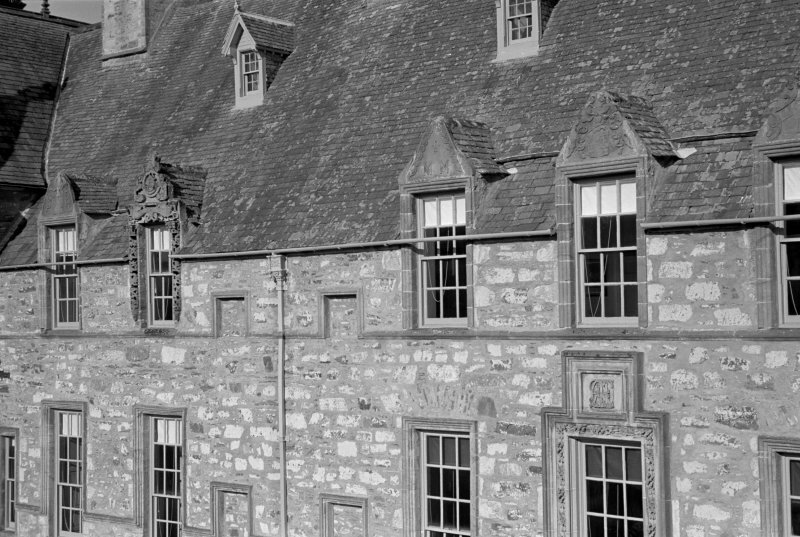 Photographic survey of Cullen House, Banffshire, by the Scottish National Buildings Record/Ministry of Work in October 1960. 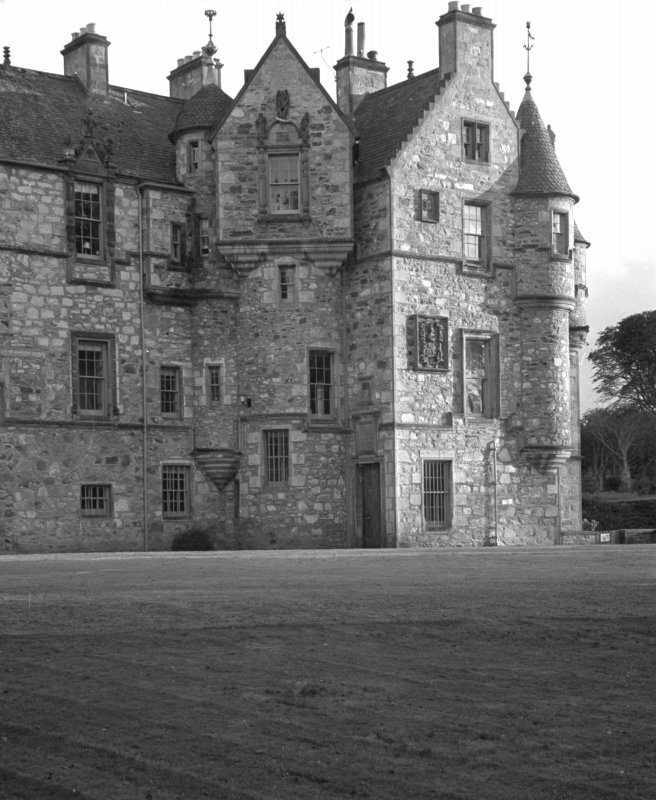 Photographic survey of Cullen House and estate, Banffshire, by the Scottish National Buildings Record in September 1960. 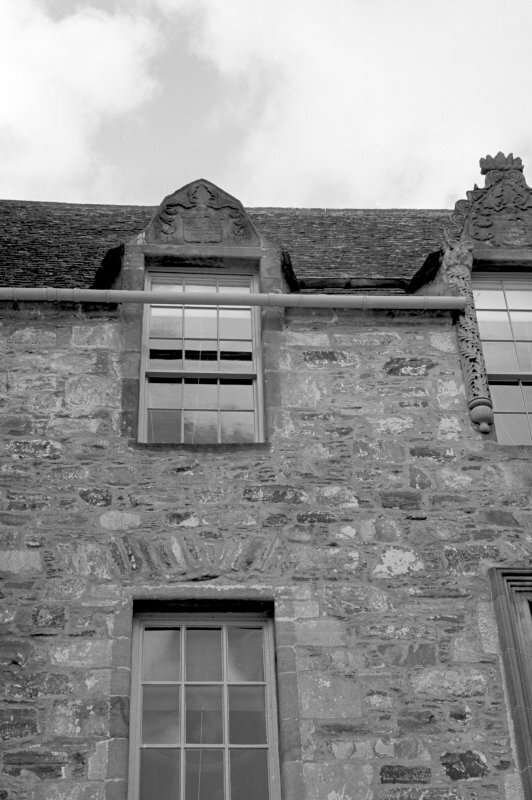 Three photographs of Cullen House, Banffshire, by the Scottish National Buildings Record/Ministry of Work in January 1961. A larger survey was carried out in October 1960.